The majority of real estate transactions in the Nosara area happen in the American Project (aka Proyecto Americano). The ‘Project’ began development in the early 1970’s and encompasses Playa Pelada, the northern third of Playa Guiones, and goes east where it meets the town of Nosara and the reserve behind the Las Huacas community. Of course, there are plenty of lots and homes located outside this region; however, the goal of this blog is to inform you of the pros and cons of the 16 sections within this specific area. For people new to the area, it can be confusing to distinguish where each section is located. Here is some insight. 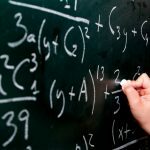 (I’ve been told a blog should be limited to about 2-pages… but there are many sections and lots of info to divulge… so please bear with me on this one). A: The ‘A Section’ is the northern boundary of The Project and has access to Playa Pelada and the Nosara River Mouth (aka the ‘Boca Nosara’ where the Rio Nosara and Rio Montana flow into the Pacific). This area is mostly residential but does include businesses, like the Lagarta Lodge and Boca Nosara Tours. There is a small mountain in the back of the A Section that has really nice views. In fact, at the crest of the mountain there are several properties with ocean views looking west and mountain/valley views looking east towards the Nosara river valley. The lower area of the A Section has quick and easy access to Playa Pelada (one of the prettiest beaches anywhere) and the Boca Nosara, which is known for great fishing, surfing, and stand up paddling on the river, and some hiking areas. The price ranges vary quite a bit depending on location, e.g. low lying areas or having great views. There seems to be more full time residents in this area than vacation homes. B: One of the sleepiest sections of town, the ‘B Section’ often goes unnoticed. Located between the main road at “5 Corners” and A Section, section “B” includes only thirty-three lots, which have traditionally been some of the most affordable lots in town. Currently, there is only one house in this section. 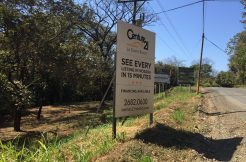 It is likely that some of these lots will someday be utilized for commercial use due to increased traffic on the main road that goes to downtown Nosara. These have traditionally been some of the most affordable lots in town. C: The majority of lots in Playa Pelada are in ‘C Section’ (no, this is not short for nor has anything to do with cesarean sections… but I knew what you were thinking ;-). There are several businesses in C, such as: La Luna, El Chivo, Olga’s, Pepperoni, Secret Spot, La Bodega and more. There are also three condominium projects and many houses built within the 176 lots. One long hill behind Playa Pelada has some nice ocean views while the rest of this area is predominantly flat, including the main road that runs from 5 Corners to Olga’s Bar on the beach in Playa Pelada. There are many lots that front the maritime zone, and about a dozen ‘squatter homes’ behind Olga’s bar and the titled lots. Most lots in ‘C Section’ are affordable, with the average lot price around $125,000. Easy beach access/parking between La Luna and Olga’s make Pelada a perfect beach for families, with some shaded areas to sit, tons of tide pools to explore, and the waves usually more gentle there than Playa Guiones. C is a healthy mix of businesses, full time residents, and vacation homes. D: Looking for great views? 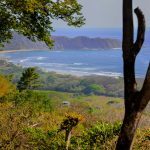 The D Section is mostly mountainous and includes some lots with dramatic ocean views overlooking the north end of Playa Guiones, all of Playa Pelada, and even looking north towards Playa Nosara and Playa Ostional. On the crest of the mountain, a handful of them even have mountain/valley views looking east. The properties with massive views are on par price wise with those in the EE Section, but lower on the mountain you will find less expensive view lots available. 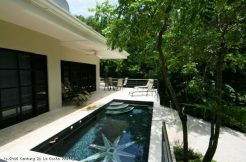 This area is also very centrally located with easy/quick access to Playa Guiones, Playa Pelada and downtown Nosara. E/F/EE: This Mountain is known locally both as “The Double E” and as the “Las Huacas Community”. Most homes in this area are in the $1million+ range, although there are some properties that are less expensive but won’t have the dramatic ocean views. Sitting just above Playa Guiones, this community is primarily residential (Tierra Magnifica is the only commercial property on the mountain). This area is the most organized section of the ‘Project’ because it is the most easily defined. There is only one entrance/exit to Las Huacas and the residents have organized their community through donations that cover security and road maintenance year round. There is a security guard at the entrance to the community and another guard who roams the area on a motorcycle. Some sections of the main road are paved. Most of the lots in this area tend to be larger than properties near the beaches. Behind the “EE Section” there is also a large wildlife refuge where the wildlife flourishes. Some of the views from Las Huacas are simply spectacular. From the top of the mountain it is roughly a five minute drive to the north entrance of Playa Guiones. G: One of the areas considered ‘downtown Playa Guiones’ would be the G Section. Many hotels/restaurants/shops are located here, and all with great access to the surf, on this northern end of Playa Guiones. Several well established businesses in this area have been staples in Nosara for years including Kaya Sol, Gilded Iguana, Burgers and Beer, Delicius Del Mundo, and the Frog Pad, just to name a few. There are also many new businesses. Many rental homes and a handful of full-time residents have settled in this popular area as well. 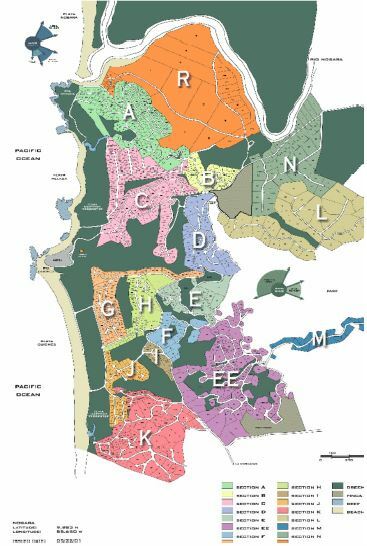 The lots tend to be smaller (which is typical as you get closer to the beach) and Section G is one of the most expensive areas in town, especially if you look at it on a ‘price per square meter’ basis. In the high season it is one of the busiest places in the Nosara area, especially in the evenings. One of three beach parking areas on Guiones is in ‘G Section’. H: Often confused with G Section, H Section runs south and east of G. There are several lots along the main road (Route 160) from Giardino Tropical down to the maritime zone by La Negra Hotel. Another road runs north/south where the Skatepark is located. G lots located closer to the beach are pricey but ideal for anything commercial and/or vacation homes. The quietest street (aka Calle de los Mangos) is more residential and has less traffic. I: The other ‘downtown’ area of Playa Guiones is “I Section” where some of Nosara’s longest standing businesses, (Café de Paris, Banco Popular, Surfing Nosara, the two clay tennis courts and the Medical Center) are located. Rental houses, businesses, and the strip malls cover most of the area. If you are looking for something commercial, this would be a good location. J: The J Section is also considered to be a ‘high rent district’ of Playa Guiones. Most lots will exceed $400/square meter and properties for sale have been hard to come by. You’ll find the ‘J Section’ by heading towards the beach from the Café de Paris area. Some of the well known businesses in ‘J’ are Nosara Surf Shop, Harmony Hotel, Century 21 Nosara, Beach Dog and Harbor Reef Hotel. The J Section ends just a few lots south of the Harbor Reef where it becomes K Section. A ‘main’ beach entrance in ‘J’ puts you right in front of the surf break. With a few relatively quiet streets, great beach access, and some privacy too, this location is ideal. There are some full time residents in J Section, but the majority of homes are for vacations/rentals. K: On the southwest side of the project you’ll find the ‘K Section’. This area has been a longtime favorite of many people looking to have a home in Nosara. The lots in this area are generally much larger than the other sections in Playa Guiones, some being several acres. There are four hills in K Section that provide ocean views, for those who can afford them. When I first came to Nosara, many older surfers commented that the ‘K Section’ reminded them of Kauai Island in the 1960’s. Over the years, many of the larger lots have been subdivided. The southern most public beach access/parking in the ‘Project’ is known as ‘Baker’s Beach’. The Bakers used to live by this entrance but it is, of course, still part of Playa Guiones. The most popular business in the ‘K Section’ was the Nosara Yoga Institute, but now that Don and Amba have sailed off into the sunset, the Bodhi Tree Yoga Resort is the largest employer. M: ‘M Section’ is a ridgeline behind the EE and has reserve on both sides of it. There are no houses in ‘M’, nor is there power/water at this time. N: Running from the gas station/Banco Costa Rica/hardware store until the intersection of downtown Nosara and the road north to Ostional, lies the N Section. Most of these properties are used for commercial purposes; however, there is a road that has some gorgeous country lots that meets the backside of the ‘L Section’ and Del Mar Academy. The lots tend to be less expensive and larger in this area. R: I can only assume that they jumped from ‘N’ to ‘R’ because the ‘R Section’ is very close to the Nosara River. 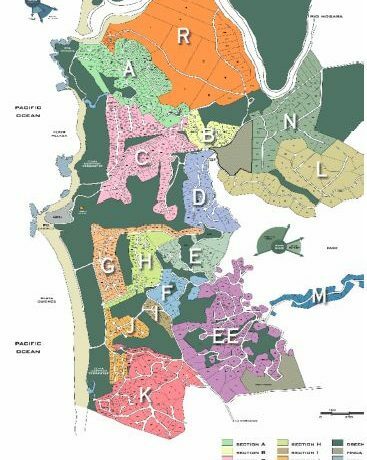 ‘R Section’ was originally very large properties only, but today some areas have been subdivided into projects like the Nosara Springs development. The two businesses in ‘R’ are Playa Ponies and the office of LHC builders, and the homes in the area are occupied by full time residents. GBC: The ‘Guiones Beach Club’ was not part of the original ‘American Project’ but has become a natural extension by its access via the ‘K Section’. ‘GBC’ is a gated community that is 100% residential with a private walking path to the sands of Playa Guiones. This development overall is high end and has a mix of full time residents and vacation homes.